According to an ancient legend, Corcianoowes it name and its origins to Coragino, mythical friend of Ulysses. Its Etruscan-Roman origins are documented from the discovery of a small etruscan necropolis and from numerous finds located at its municipal offices. 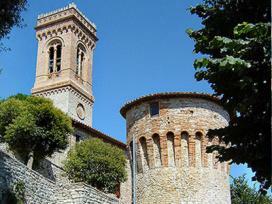 In 1242 Corciano was a free city, although very closely related to the nearby and dominant city of Perugia. The renaissance period was very flourishing for this town, which allowed it to adorn itself with characteristic buildings and prestigious works of art. Upon entering Corciano from Porta S. Francesco, you gain access to the Corso Cardinale Rotelli, the main street of the historic centre. Immediately to your right is located the Palazzo municipale (16th Century), originally the residence of the two dukes of Corgna, which preserves prestigious decorations and designs. Of particular importance are those of the Ceiling of the Council room (end of 16th Century), produced by the Zuccari. Continuing on one reaches the Palazzo del Capitano del Popolo (15th Century), ancient residence of the representative from the dominating city of Perugia, with on its side the Palazzo dei Priori and of the Mercanzia. Continuing one arrives at ‘piazza Coragino', where one finds a lovely round well from the 16th Century. To the right appears the Santa Maria Assunta, a church from the 13th century. Inside are preserved two picturesque works of art of high value: the Gonfalone by Benedetto Bonfigli, (1472), and the Assunta by the Perugino (1513). Farther along one comes to the small church of San Cristoforo, from the first half of 1500, which hosts a collection of sacred art. Of particular interest is the Museo della Corsa Contadina which reproduces, with authentic household and work objects, the typical corcianese dwelling of the preindustrial period. Also noteworthy is the ancient ‘Spedale' of the town, which preserves an affresco from 1494 attributed to Andrea D'Assisi, known as the ‘Ingegno'. A touch farther along one finds the Torrione di Porta Santa Maria, the Corciano emblem, built in 1482, followed by a beautiful promenade built on top of the ancient walls, from which one can admire two Romanesque sculptures of lions. The San Francesco Church, gothic, contains several works of art, including a crucifix from the fifth Century, a Bandiera canvas, a statue of San Bernardino dell'Orsini, and a table of the Caporali, in addition to affrescos from the umbro-senese discipline from the 14th and 15th Centuries. Among the most important manifestations taking place in the city we should absolutely mention the Festival of Corciano.